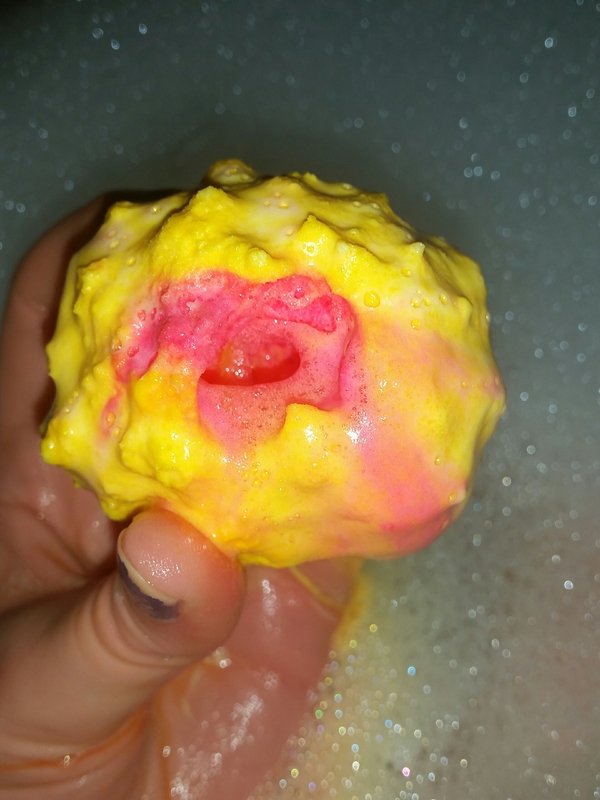 These are fairly inconsistent bath bombs in terms of appearance as some are evenly yellow and pink while others, like this one, is 75% yellow on the outside layer. But there is something about the uniqueness and messyness of the look of these bathbombs that somewhat adds to its charm. Part of the colour combination left me thinking about sweet treats and rhubarh and custard and as a result my mind had created ideas about what scent this product would have. Whilst it is not super fruity it certainly has a sweetness too it, perhaps more like a rhubarb and custard sweet, that makes it really enjoyable. The sweetness is not overwhelming and over reminded me quite a lot of those Love Heart sweets with little messages on them. To some that probably sounds hellish as sweet scents can be a real turn off for a bath product and for a moment I felt the same but over the course of the bath it really won me over. If I had some Wilkos rhubarb and custard bath foam I would certainly combine the too! As it fizzed away in the water the fact this one had more yellow on the outside was forgiven because as the core disappeared first and it started to spin around a pinker inside was revealed creating a beautifully contrasting pink and yellow swirl among the bubbles. 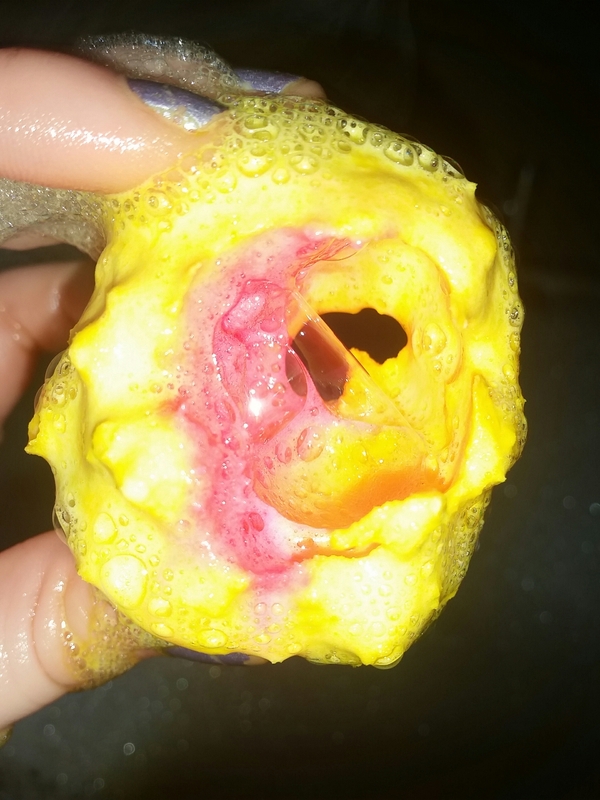 Of course it is not the prettiest looking bath bomb mid-fizz and in fact looks a bit like a terrifying monster at certain points but the scent and the shades kind of let it off that. It looks great in the water, where it belongs, so ultimately the answer is do not be a pratt like me and take it out for a few photos. 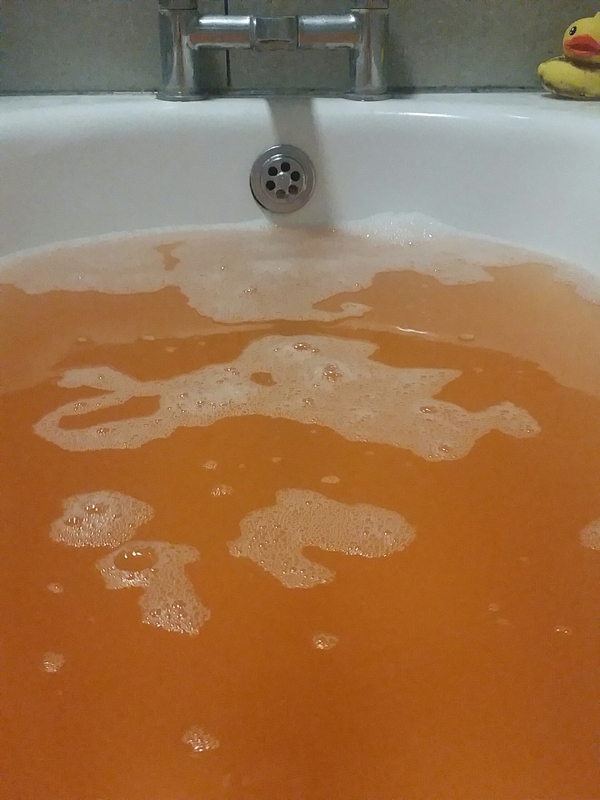 Of course once the colours have combined in the bath they go a vibrant orange, the sort of shade I expected from Satsuma, and it was stunning. The vibrancy and the pure orange really helped keep an uplifting feel rather than being pulled down by a dull or strange shade and that is something of a rarity with Lush products I have used over recent months. In my last blog I raved about the Autumn Leaf product and whilst they are completely different scents they both come pretty close in being joint favourites. I can imagine using Never Mind The Ballistics all year round and the fact it did not crumble apart made it a bonus too so this one probably wins out. If you love sweet scents then this would be one to keep an eye out for in the future! I will certainly be hoping it makes another appearance. This entry was posted in Bath/Shower, Beauty and tagged ballistic, bath, bath bomb, bblog, bblogger, bbloggers, Beauty, beauty blog, beauty blogger, beauty bloggers, beauty product, beauty review, christmas, lblog, lblogger, lbloggers, life, Lifestyle, lifestyle blog, lifestyle blogger, lifestyle bloggers, limited edition, lush, lush cosmetics, never mind the ballistics, pamper, pink, review, selfcare, winter, yellow. Bookmark the permalink.